This series shares my own story about my physical and spiritual development as a women that has up until very recently been a story of control rather than of understanding. Controlling my sexuality, my menstruation, my physique and my emotions in order to conform to the broken societal image of “the woman” that I have silently and explicitly been exposed to all my life. This pressure women undergo to control themselves has led a vast majority to ingest and insert a variety of pills and tools that all have perpetual side effects that are continuously dismissed and misunderstood in our culture. In this particular series, the artist is addressing birth control, firmly exposing that these methods of regulation via pills and IUDs are weapons of destruction against women’s’ bodies and minds. I myself have endured the side effects of different types of birth control such as hormonal deregulation, physical changes and mental instability and wanted to share the violent challenges I went through in order to give visibility to this seemingly invisible issue that countless women go through. As an environmental artist, I always include local flora and fauna in my work as a way to give homage to my natural surroundings and also to prioritizes the disclosure of natural knowledge as a way of healing, growth and community building. Featured in Broken cycle and Pop is the Artemisia vulgaris and the yarrow flowers that have been traditionally used as relievers for period pains throughout Europe. The branches in Broken Cycle are those of the Ceibo tree, commonly known as the World Tree by certain indigenous communities in Ecuador due to its huge size and is also said to have protective powers. 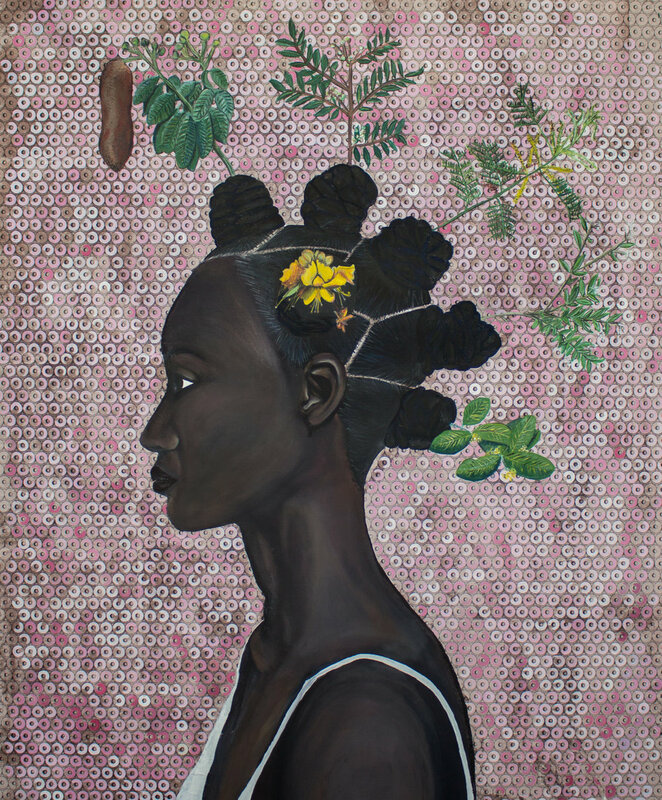 The Kalbreyeriana’s leaves, featured in Pop, are used by certain Afro-Colombian communities to invoke the “madre de agua” an avenging spirit of water that will throw evil spirits into the water to drown them. Puerto Rico was hit by hurricane Maria in September 2017. As someone who has spent a lot of time there visiting friends and doing field work, I felt the need do whatever I could in order to offer support to the communities that were the most affected on the island. I designed these shirts and was able to raise 2500$ by selling them for a few months on my university's cmpus and at events in Durham. All the proceeds were donated directly to the Hurricane Maria Community Recovery fund (a fund that was suggested to me by friends on the island which you can learn more about here: http://mariafund.org).